Mobile data analytics company Informate Mobile Intelligence has, in keeping with the cricket mood that pervades the country this week following the semi-final, listed out the top ten websites, apps and games that are popular amongst mobile users. India has almost reached 800 million mobile users (771.18 million as of January 2011) and is growing at 2.52 % month on month. 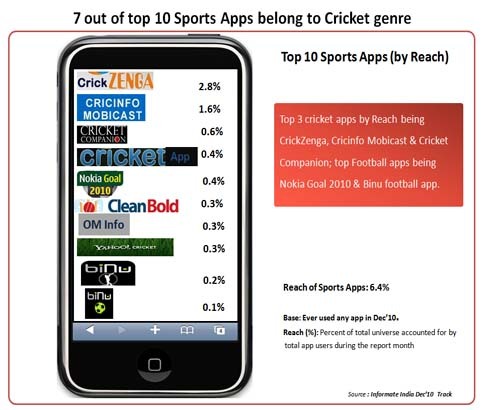 The company notes that 4 out of the top 5 sports websites being browsed on the mobile are cricket specific sites; while 7 out of top 10 Sports apps belong to the cricket genre and 5 out of top 10 sports games played by Indian mobile users are cricket related. Note that the study is only indicative. For more on the methodology, read SmartMobi.in. 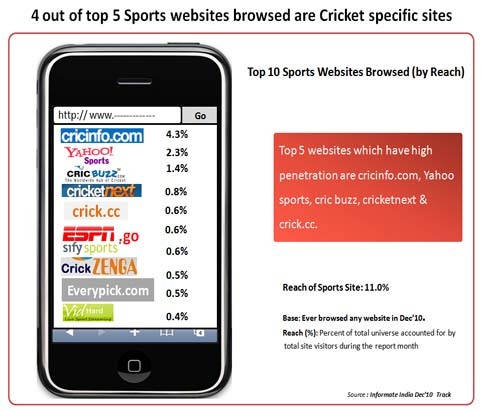 The top cricket site Cricinfo.com from the stables of ESPNStar also holds the top position in the mobile domain. Yahoo Sports is next followed by CricBuzz.com, by the Bangalore-based Akuate Internet Services, an IT service provider. CricketNext.com and Crick.cc are also popular WAP sites fans are visiting on the mobile. CrickZenga Cricket Companion app by mobile value added services (VAS) provider Zenga Entertainment is the top app favoured by Indian mobile users. The app is available on Android, iPhone, Samsung BADA, and Windows Mobile 7 devices. Cricinfo Mobicast by ESPNStar's Cricinfo.com and app maker Plusmo, an AT&T Interactive company. Cricinfo Mobicast delivers live cricket scores and the website's ball by ball commentary updates to mobile users as well as audio podcasts. Clean Bold by Coimbatore-based Broov Information Services is also gaining popularity amongst mobile users. Amongst the top sports games being played, the 2010 Twenty20 Premier League game developed by Synqua Games was most popular followed by the feature-packed EA Cricket 10. As a reader has noted, the top game is not the official DLF IPL T20 fever game. 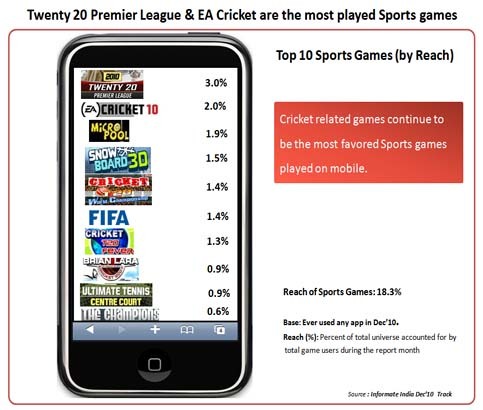 Symbian OS based CricketT20 Fever and Brian Lara Cricket are also being played by mobile gamers.